A heterotroph is an organism that cannot manufacture its own food by carbon fixation and therefore derives its intake of nutrition from other sources of organic carbon, mainly plant or animal matter. In the food chain, heterotrophs are secondary and tertiary consumers. Carbon fixation is the process of converting inorganic carbon (CO2) into organic compounds such as carbohydrates, usually by photosynthesis. Organisms, which can use carbon fixation to manufacture their own nutrition, are called autotrophs. There are two forms of heterotroph. Photoheterotrophs use light for energy, although are unable to use carbon dioxide as their sole carbon source and, therefore, use organic compounds from their environment. Heliobacteria and certain proteobacteria are photoheterotrophs. Alternatively, chemoheterotrophs obtain their energy from ingesting preformed organic energy sources such as lipids, carbohydrates and proteins which have been synthesized by other organisms. By consuming reduced carbon compounds, heterotrophs are able to use all the energy that they consume for growth, reproduction and other biological functions. Heterotrophs that eat plants to obtain their nutrition are called herbivores, or primary consumers. During photosynthesis, complex organic molecules (carbon dioxide) are converted into energy (ATP) through cellular respiration. The ATP is often in the form of simple carbohydrates (monosaccharaides), such as glucose, and more complex carbohydrates ( polysaccharides), such as starch and cellulose. Starch is easily broken down by most animals, due to the presence of an enzyme secreted from the salivary glands and pancreas called amylase. Cellulose, which is a major component of plant cell walls and an abundant carbohydrate, converted from inorganic carbon, is harder to digest for many animals. Most herbivores have a symbiotic gut organism, which breaks down the cellulose into a usable form of energy. The energy that is transferred through the food chain, initially from the inorganic compounds, converted to organic compounds that are used as energy by autotrophs, is stored within the body of the heterotrophs called primary consumers. The energy carnivores can use as energy mainly comes from lipids (fats) that the herbivore has stored within its body. Small amounts of glycogen (a polysaccharide of glucose which serves as form of long term energy storage) is stored within the liver and in the muscles and can be used for energy intake by carnivores, although the supply is not abundant. Carnivores are usually predators, such as secondary consumers: heterotrophs which eat herbivores, such as snakes, birds and frogs (often insectivores) and marine organisms which consume zooplankton such as small fish, crabs and jellyfish. They may also be tertiary consumers, predators that eat other carnivores, such as lions, hawks, sharks, and wolves. Carnivores may also be scavengers, animals such as vultures or cockroaches, which eat animals which are already dead; often this is the carrion (meat) of animals that has been left over from the kill of a predator. Fungi are heterotrophic organisms, although they do not ingest their food as other animals do, but feed by absorption. Fungi have root-like structures called hyphae, that grow and form a network through the substrate on which the fungi is feeding. These hyphae secrete digestive enzymes, which break down the substrate, making digestion of the nutrients possible. Fungi feed on a variety of different substrates, such as wood, cheese or flesh, although most of them specialize on a restricted range of food sources; some fungi are highly specialized, and are only able to obtain nutrition from a single species. Many fungi are parasitic, which means they feed on a host without killing it. Although, most fungi are saprobic, meaning they feed from already dead or decaying material, such as leaf litter, animal carcasses and other debris. The saprobic fungi recycle the nutrients from the dead or decaying material, which becomes available as nutrients for animals that eat fungi. The role of decomposers that fungi have as recyclers at all trophic levels of the nutrient cycle is extremely important within ecosystems, although they are also highly valuable to humans economically. Many fungi are responsible for production of human food, such as yeast (Saccharomyces cerevisiae), which is used to make bread, beer and cheese. Fungi are also used as medicines, such as penicillin. Autotroph – Also known as ‘primary producers’, these are organisms that can fix inorganic carbon as an energy source; most plants are autotrophs. Energy pyramid – The flow of energy through a food chain can be visualized as a pyramid, as energy is lost throughout each level. Trophic Level – One of the hierarchal levels of a food chain in an ecosystem. Nutrient Cycle – The movement or exchange of inorganic and organic material in the production of living organisms. D is correct. Heterotrophs can obtain their energy in a number of different ways; this includes heterotrophs, which use light for energy, although they cannot use inorganic carbon (CO2) as their sole carbon source (photoheterotrophs). B is correct. The process of obtaining energy through photosynthesis involves fixing inorganic carbon (CO2) from the atmosphere using light. 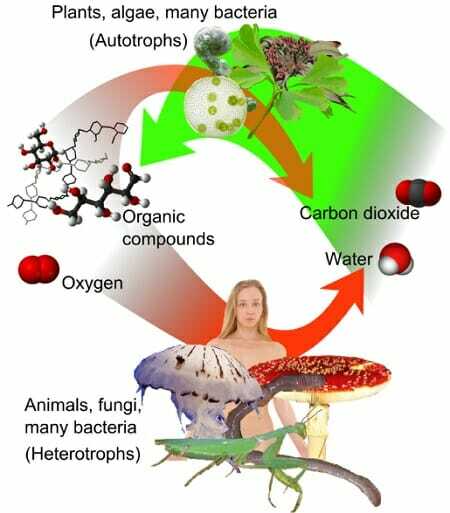 Organisms that can fix carbon are called autotrophs. 3. By which process is inorganic carbon (CO2) converted into organic carbon (C)? C is correct. Inorganic carbon is converted into organic carbon, energy called ATP, through cellular respiration. This usually happens as part of the photosynthesis process.